HISTAMINE INTOLERANCE Archives - Is Food Making You Sick? 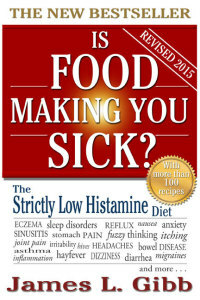 HISTAMINE INTOLERANCE Archives - Is Food Making You Sick? If your histamine intolerance symptoms are extremely severe, then in addition to adhering to the Strictly Low Histamine Diet you may wish to take some additional supplements. Here are some suggestions. * Low-acid Vitamin C 1000 mg twice daily. Note: Standard Vitamin C supplements work well too, but but if you are taking high doses you may experience a burning or irritating sensation in the urinary tract. People with certain conditions such as interstitial cystitis, prostatitis and stomach ulcers often have a hard time tolerating high-acid vitamin C supplements. * Vitamin B6 100 mg once daily. Note: never exceed the recommended dose. 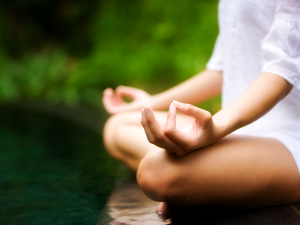 Your body needs Vitamin C and vitamin B6 to manufacture the DAO enzyme, which helps break down histamine in the body. Copper is also necessary for DAO production, but too much copper can be toxic. If your diet includes variety of fresh, unprocessed foods it will already provide you with sufficient copper and you won’t need copper supplements. * Digestive enzymes, one capsule before each meal. Choose a broad spectrum formula, including digestive enzymes to break down both protein (such as pepsin) and carbohydrates (such as amylase). Those who are histamine intolerant need help digesting protein, so that it does not linger in the gut fermenting and producing bacteria and histamine. * Vira Stop is an enzyme formula dedicated to breaking down protein. The recommended dose is 2 capsules daily. Begin gradually, by taking half a capsule per day and build up to 2 capsules over a few weeks. You should take this supplement on an empty stomach – i.e. either one hour before you eat or two hours afterwards. Never swallow probiotics and Vira Stop at the same time because they can interfere with each other. * Probiotics. There are two species that actually cause histamine to be released in the body and those are Lactobacillus casei and Lactobacillus bulgaricus. Avoid them. Two very important types for people with histamine intolerance are Bifido infantis and Bifido longum. Take any probiotic supplement that contains both of these. * Zinc inhibits the release of histamine from mast cells. Take 50mg of zinc per day, with a meal containing starch. This helps your body to absorb the zinc. Remember that what you leave out of your diet to control histamine levels is probably even more important than what you take in via supplements. Taking every recommended supplement will have little effect if you are still eating histamine-rich or histamine-triggering foods. Consult the book for the complete diet. Should Histamine Intolerance sufferers go gluten free? Some people believe that if you suffer from histamine intolerance you should go gluten free. These days, there is a fashion for avoiding gluten-containing foods because ‘gluten free’ is perceived as ‘healthier’. 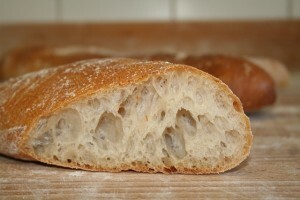 Gluten-containing foods include wheat, barley, rye, triticale, kamut and spelt. Gluten is a natural plant protein that helps bread rise and gives bread, cakes, pastry, pasta, noodles, and similar foods their elasticity and texture. Foods that happen to contain gluten may also be a problem for people who are sensitive to those particular foods. For example, you may not be celiac or NCGS, but you might have been diagnosed as being sensitive to wheat, for reasons other than its gluten content. People with histamine intolerance should avoid wheat germ, in any case. If you have celiac disease or NCGS then it is vital to avoid gluten because it can cause intestinal permeability, which is also known as ‘leaky gut’. This can in turn lead to DAO insufficiency and thus to histamine intolerance. Gluten intolerance is also linked with autoimmune diseases. However if you are, like the vast majority of the population, perfectly capable of digesting gluten without any problems, gluten-containing foods are actually good for you. They are highly nutritious – packed with vitamins, minerals and beneficial fiber. In a normal, healthy person gluten will not cause a leaky gut. And the odds are, you are one of the 99% who can digest gluten. Even if your celiac test comes up negative, you could try avoiding all gluten for at least 30 days to see if that makes your health improve. If you do feel better, this might indicate that you have NCGS. If you really are gluten intolerant you’d have to cut out all gluten, down to the tiniest particle. An ‘almost-gluten-free’ diet will not help at all. The book “Is Food Making You Sick?” contains a large number of gluten free, low histamine recipes. Many people with histamine intolerance regularly take medications to control heartburn. Histamine acts to increase hydrochloric acid secretion by cells in the stomach lining. An overload of histamine can cause the production of excess stomach acid, which is why one of the treatments for heartburn is the H2 antagonist Ranitidine. Pantoprazole is another drug for heartburn patients that decreases the amount of acid produced in the stomach. The problem is, long-term treatment with pantoprazole may also decrease the body’s ability to absorb vitamin B-12, resulting in a deficiency of this vitamin. Vitamin B12 (cobalamin) is an essential vitamin, required for DNA synthesis (and ultimately cell division) and for maintaining nerve myelin integrity. Symptoms of a vitamin B-12 deficiency may develop slowly and include pale skin, weakness, tired feeling, shortness of breath, and a fast heart rate. Vitamin B12 deficiency can potentially cause severe and irreversible damage, especially to the brain and nervous system. When levels of B12 are only slightly lower than normal, they can lead to a range of symptoms including fatigue, depression and memory loss. Foods richest in Vitamin B12 include shellfish, liver, fish, crustaceans, fortified soy products, fortified cereals, red meat, milk, cheese and eggs. Most of these foods are also high in histamine, and are best avoided by people with histamine intolerance. Fortified cereals are processed foods with B12 (not methyl B12) added to them by the manufacturer. Furthermore, not everyone is able to absorb Vitamin B12, even if they eat foods that contain it. The human physiology of vitamin B12 is complex, and therefore may go awry, leading to B12 deficiency. Long-term use of acid-reducing drugs, e.g. Pantoprazole. One way to combat Vitamin B12 deficiency is to take supplements. However, most Vitamin B12 supplements are in the form of cyanocobalamin rather than methylcobalamin. Cyanocobalamin is artificially synthesized in laboratories. One of the main ingredients is potassium cyanide – yes, you read it right – cyanide, the well-known poison. Cyanocobalamin is the form used in most pharmaceutical preparations because adding cyanide stabilizes the molecule. When we ingest cyanocobalamin, we are being exposed to small amounts of cyanide. Furthermore, cyanocobalamin is harder for our bodies to metabolize than methylcobalamin. Many people with histamine intolerance are, without being aware of it, ‘undermethylators’. Undermethylation, or ‘histadelia’, is an inherited condition characterized by elevated blood levels of histamine. If our bodies cannot properly methylate vitamin B12, they cannot adequately absorb it. 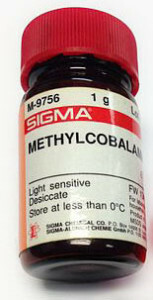 Methylcobalamin is already methylated, and thus more easily assimilated into the body. 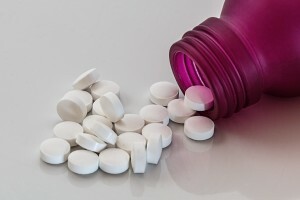 If you are histamine intolerant – or even if you’re not – the optimum way to make sure you’re not Vitamin B12 deficient is to take methylcobalamin. It is available from pharmacies as pleasantly-flavored pills or drops, to be dissolved slowly under the tongue. For those who are interested in finding out more about how to obtain methylcobalamin, we’ve provided a link below (click on the picture).